WASHINGTON (CNS) — A coalition of Jesuit schools and universities is encouraging those in their network and beyond to celebrate Valentine’s Day this year by sending cards to lawmakers, asking them and others to “love your neighbor” and send “migrants welcome” Valentine’s Day messages from Feb. 11-18. 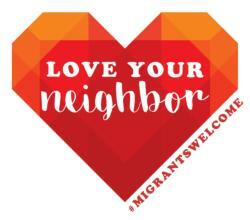 The cover features a red heart with the words “Love your neighbor” and “Migrants Welcome.” They are meant to be sent to members of Congress and it is part of a larger, two-year “campaign for hospitality.” The network also is offering stickers with the same message. All materials are free and available at www.ignatiansolidarity.net/campaignforhospitality. The campaign is an effort to promote a “culture of hospitality” toward those who migrate, said the network’s executive director, Christopher Kerr.